But the distant star, known as Kepler 11145123, has Earth, the sun and every other object that's ever been measured beat in terms of roundness, study team members said. 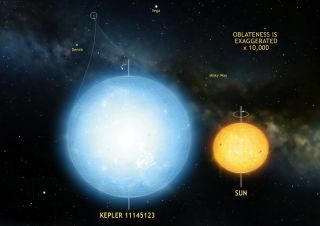 The team, led by Laurent Gizon from the Max Planck Institute for Solar System Research and the University of Göttingen in Germany, then used this information to determine the star's size. This technique is known as asteroseismology, because it allows astronomers to probe stellar interiors in much the same way that geologists use earthquakes to study our planet's insides. The researchers found that Kepler 11145123's equatorial and polar diameters differ by a mere 3.7 miles (6 km), even though the star is 1.86 million miles (3 million km) in diameter — about twice as wide as the sun. "This makes Kepler 11145123 the roundest natural object ever measured, even more round than the sun," Gizon said in a statement. Why is the star so round? It rotates about three times more slowly than the sun, but that's probably not the whole story. Magnetic fields can also help flatten stars, so part of the answer may lie in Kepler 11145123's magnetic environment, astronomers said. There's no guarantee that Kepler 11145123 will keep its roundness record forever. Gizon and his colleagues plan to study other stars using their asteroseismological techniques, which they said have delivered unprecedented precision and may therefore open up new lines of inquiry. "It will be particularly interesting to see how faster rotation and a stronger magnetic field can change a star’s shape," Gizon said. "An important theoretical field in astrophysics has now become observational."